Alienware says owners of its Steam Machine will be able to update the hardware, but it won't be easy. Remember when Alienware said that its Steam Machine won't be upgradeable and recommended that people who want a viable upgrade path should stick to the X51 PC? That was Tuesday. But this is Thursday, and the company now says that it will be upgradeable after all, but to a more limited extent than conventional PCs. "Enabling customers the opportunity to upgrade components has been a core tenet for Alienware since the company was founded, and that remains true today," Alienware boss Frank Azor told Eurogamer. 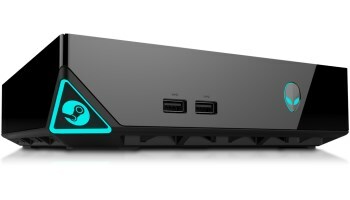 "The Alienware Steam Machine announced at CES is designed to deliver a great gaming experience in the living room, and we will enable customers to upgrade components. Considering we've purposefully designed the Alienware Steam Machine to be smaller than the latest generation consoles, upgrading the internal components will not be as easy as compared to other platforms, such as the Alienware X51, but we will not prevent a customer from upgrading." In reality, it's not that different from what he said originally; after all, amazing things can be done with a screwdriver and the right attitude. But upgradeable by mainstream users who aren't interested in a crash-course in electrical engineering is another matter entirely, and to be fair to Alienware and everyone else who makes these things, you can have a tiny form factor or you can have easy upgrades, but generally speaking you can't have both. Azor reinforced that point by repeating that customers who want to be able to upgrade their hardware in the future should stick to a PC. "We feel we have multiple options for customers based on their individual needs," he said. "If a gamer wants more freedom to upgrade, we have the X51. If they would prefer a smaller, more console-like system, we will offer the Alienware Steam Machine."